Since the 2010 midterm elections, the Tea Party has not only lost support nationwide, but also in the congressional districts represented by members of the House Tea Party Caucus. And this year, the image of the Republican Party has declined even more sharply in these GOP-controlled districts than across the country at large. In the latest Pew Research Center survey, conducted Nov. 9-14, more Americans say they disagree (27%) than agree (20%) with the Tea Party movement. A year ago, in the wake of the sweeping GOP gains in the midterm elections, the balance of opinion was just the opposite: 27% agreed and 22% disagreed with the Tea Party. At both points, more than half offered no opinion. Throughout the 2010 election cycle, agreement with the Tea Party far outweighed disagreement in the 60 House districts represented by members of the Congressional Tea Party Caucus. 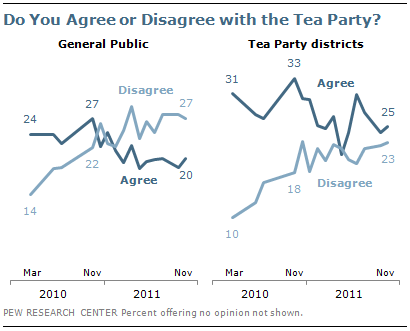 But as is the case nationwide, support has decreased significantly over the past year; now about as many people living in Tea Party districts disagree (23%) as agree (25%) with the Tea Party. Among the public, 36% now say they have a favorable opinion of the Republican Party, down from 42% in March. By comparison, opinions of the Democratic Party have shifted less – from 50% favorable last summer to 48% in March and 46% in October. 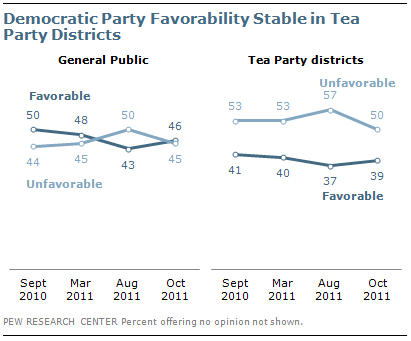 The party’s image has remained in negative territory among those living in Tea Party districts throughout this period– currently about four-in-ten (39%) say they have a favorable view of the Democratic Party, while 50% offer an unfavorable view. 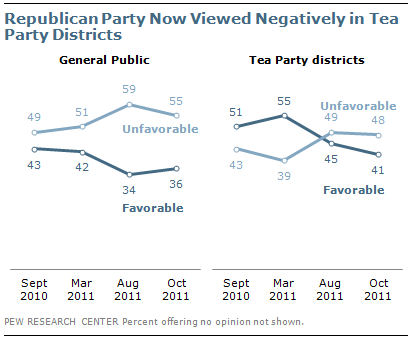 But the steep decline in GOP favorability in Tea Party districts means that these constituencies now view the Republican Party about as negatively as the Democratic Party. As recently as March, GOP favorability exceeded Democratic Party favorability by 15 points (55% vs. 40%). Today, both parties receive about the same rating from people in Tea Party districts (41% favorable for the GOP, 39% for the Democratic Party).